Salem's Lot (also known as Salem's Lot: The Movie, Salem's Lot: The Miniseries and Blood Thirst) is a 1979 American miniseries television adaptation of the horror novel of the same name by Stephen King. Directed by Tobe Hooper and starring David Soul and James Mason, the plot concerns a writer who returns to his hometown and discovers that its citizens are turning into vampires. Salem's Lot combines elements of both the vampire film and haunted house subgenres of horror. At a church in Guatemala, a man and a boy, Ben Mears and Mark Petrie, are filling small bottles with holy water. When one of the bottles begins to emit an eerie supernatural glow, Mears tells Mark that "they've found us again." Knowing an evil presence is nearby, they decide to stay to fight it. Two years earlier, Mears, a successful author, returns after a long absence to his small hometown of Salem's Lot in Maine in the United States. Mears intends to write a book about the Marsten House, an old, ominous property on a hilltop which has a reputation for being haunted and attempts to rent it. However, Mears finds that another new arrival in town, the mysterious Richard Straker, has recently bought the Marsten House. Straker is also in the process of opening an antique shop with his oft-mentioned but always absent business partner, Kurt Barlow. Meanwhile, Mears moves into a boarding house in town run by Eva Miller and develops a romantic relationship with a local woman, Susan Norton. He befriends Susan's father, Dr. Bill Norton), and reconnects with his kindly former school teacher, Jason Burke. Mears tells Burke that he feels the Marsten House is somehow inherently evil, recalling a traumatic childhood experience which took place inside it. After a large crate is delivered to the Marsten House one night, an increasing number of townspeople begin to disappear or die under strange circumstances. Mears and Straker are the main suspects as they are both new in town, but it eventually becomes clear that the crate contained Straker's business partner, Kurt Barlow — an ancient master vampire who has come to Salem's Lot after sending Straker to make way for his arrival. Straker kidnaps a young boy, Ralphie Glick, as an offering to Barlow, while Barlow himself kills local realtor Larry Crockett. The Glick boy then returns as a vampire to claim his brother, Danny. After his funeral, the undead Danny infects a gravedigger, Mike Ryerson, and attempts to prey on one of his schoolfriends, Mark Petrie. However, Mark is a horror film buff and manages to repel Danny with a cross. As the vampirism spreads, Mears, Burke, and Dr. Norton gradually realize what is happening to the town and attempt to stop it. Mears is attacked by Ralph and Danny's presumed-dead mother Marjorie Glick after she revives on a mortician's table, but Mears defends himself using a makeshift cross. Mark's parents are both killed by Barlow, though Mark is allowed to escape thanks to some assistance from a local priest. Jason Burke, however, suffers a severe heart attack following an encounter with the newly vampirised Mike Ryerson. Seeking revenge for his parents' deaths, Mark breaks into the Marsten House, and a concerned Susan follows him inside; both are soon captured by Straker. Later, Mears and Dr. Norton enter the house, too, where Straker kills Norton by impaling him on a pair on antlers before he himself is fatally shot by Mears. Afterwards, Mears and the freed Mark find Barlow's coffin in the cellar and destroy him by driving a stake through his heart. Fleeing the other vampires in the house (the infected townsfolk), the two set fire to the Marsten property as they leave, though Susan is nowhere to be found. While the house burns, the wind carries the fire towards the town itself. As he and Mark drive away from Salem's Lot, Mears comments that the fire is a good thing because it will drive all the vampires from their hiding places and purify the town from the evil that has engulfed it. The story returns to Mears and Mark at the church in Guatemala two years later. It becomes clear that they are on the run from the surviving Salem's Lot vampires, and that their bottles of holy water glow whenever a vampire is nearby. Realising that they have been tracked down yet again, Mears and Mark return to their lodgings to collect their belongings. Once there, Mears finds Susan lying in his bed. Now a vampire, she prepares to bite him as he leans down to kiss her, but instead Mears drives a stake through her heart and kills her. A grief-stricken Mears then leaves with Mark, knowing that the vampires will continue to pursue them. After Warner Bros. acquired the rights to 'Salem's Lot, the studio sought to turn the 400-page novel by Stephen King into a feature film, while still remaining faithful to the source material. Producer Stirling Silliphant, screenwriter Robert Getchell, and writer/director Larry Cohen all contributed screenplays but none proved satisfactory. "It was a mess," Stephen King said. "Every director in Hollywood who's ever been involved with horror wanted to do it, but nobody could come up with a script." The project was eventually turned over to Warner Bros. Television and producer Richard Kobritz decided Salem's Lot would work better as a television miniseries than as a feature film format due the novel's length. Television writer Paul Monash was contracted to write the teleplay, having previously produced the film adaptation of Stephen King's novel Carrie and worked on the television series Peyton Place and as such was familiar with writing about small towns. A screening of The Texas Chain Saw Massacre (1974), resulted in Richard Kobritz selecting Tobe Hooper as director. With a budget of $4 million, principal photography began on July 10, 1979, in the Northern California town of Ferndale, with some scenes filmed at the Burbank studios. Filming officially wrapped on August 29, 1979. Although generally the same story, the television adaptation takes several liberties with King's source novel. Many characters have been combined or merely deleted, as have certain subplots, and the character of Barlow is vastly different in the miniseries from how he is in the novel. However, Stephen King praised Paul Monash's screenplay and commented "Monash has succeeded in combining the characters a lot, and it works." Other changes by Kobritz included having the final confrontation with Barlow in the cellar of the Marsten House whereas in the book it is in the basement of Eva Miller's boarding house, a concept Kobritz felt "Just doesn't work. I mean, from a point of sheer construction in a well-written screenplay, he's got to reside in the inside of the Marsten House. He's a major star in the picture - the third or fourth most important character - he's got to be there. It may have worked in the book, but not in the movie." Susan's death was also moved to the climax, to give her death "more impact and provide the film with a snap ending." For the roles of Richard K. Straker and the vampire Kurt Barlow, James Mason and Reggie Nalder had been on producer Richard Kobritz's "wish list". Kobritz sent Mason a copy of the script, who loved the part and his wife, Clarissa Kaye-Mason, was also cast as Marjorie Glick. However, Nalder was less impressed. "The makeup and contact lenses were painful but I got used to them. I liked the money best of all." The miniseries also features Elisha Cook, Jr. as Weasel Philips and Marie Windsor as Eva Miller, two characters with a relationship. This casting was an inside joke by producer Kobritz, a fan of Stanley Kubrick; Cook and Windsor had previously played a couple in Kubrick's The Killing (1956). Salem's Lot does not rely on the same kind of dynamics as The Texas Chainsaw Massacre. "This film is very spooky - it suggests things and always has the overtone of the grave. It affects you differently than my other horror films. It's more soft-shelled," director Tobe Hooper explains. "A television movie does not have blood or violence. It has atmosphere which creates something you cannot escape - the reminder that our time is limited and all the accoutrements that go with it, such as the visuals." Although Salem's Lot was aimed at television, a European theatrical release was also planned and which would include more violence. For example, two versions of the scene where Cully Sawyer threatens Larry Crockett with a shotgun were filmed. In one version, Larry holds the gun barrel in his mouth, while in the other, the barrel is in front of his face. "They worked at a feature film pace instead of a TV pace," recalled actor Lance Kerwin on the filming. "It's really even hard to tell the flow of the film. It was a miniseries originally, then we shot a feature film version for Europe at the same time. They've edited and cut together so much." A full-scale mock-up of the Marsten House was built over a smaller house. 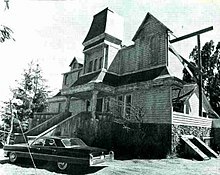 Unable to find a house in Ferndale that resembled the Marsten House from the book, an estimated $100,000 was spent on constructing a three-story facade over an already-existing house on a hillside, overlooking Ferndale and the Eel River Valley. Designed by Mort Rabinowitz, it took 20 days to build. Another $70,000 was spent on constructing the interior set of the house which proved even more difficult for designer Rabinowitz, who also designed the building of Straker's antique shop and the small village in Guatemala where the beginning and end of the miniseries is set. The vampire makeup involving glowing contact lenses was invented by Jack Young. According to Tobe Hooper, the makeup on actor Reggie Nalder would constantly fall off, as well as the fake nails and teeth, and the contact lenses would go sideways. The contact lenses could only be worn for 15 minutes at a time before they had to be removed to let the eye rest for 30 minutes. The vampire levitations were accomplished by placing the actors on a boom crane instead of traditional wires: "We didn't fly our vampires in on wires, because even in the best of films you can see them," producer Richard Korbitz explained. "We wanted to get a feeling of floating. And the effect is horrific, because you know there are no wires. It has a very spooky, eerie quality to it." The levitation sequences were also shot-in-reverse [sic] to make the scenes more eerie. With producer Richard Kobritz wanting "a good, atmospheric, old-fashioned, Bernie Herrmann-type score", the score was composed and conducted by Harry Sukman, whom Korbitz described as "a former cohort and protege of Victor Young". Tobe Hooper, a great admirer of Alfred Hitchcock, pays several homages to Psycho (1960) in Salem's Lot. The appearance of Kurt Barlow is an homage to Count Orlok in Nosferatu (1922). Salem's Lot had a significant impact on the vampire genre, as it inspired horror films such as Fright Night (1985) and the scenes of vampire boys floating outside windows would be referenced in The Lost Boys (1987) (and later spoofed in The Simpsons episode "Treehouse of Horror IV"). Salem's Lot has also been cited as one of the primary influences for Joss Whedon's hit TV series Buffy the Vampire Slayer. Writer Bryan Fuller stated that the scene where a character is impaled on a deer's antlers in Salem's Lot inspired him to do a similar scene in his 2013 TV series Hannibal because the original scene frightened him so much as a child. Salem's Lot has received generally positive reviews. Review aggregate website Rotten Tomatoes reports 88% of critics gave the movie positive write-ups based on 17 reviews, with an average rating of 6.7/10. British film critic Mark Kermode has called it "very scary" and "one of the very best screen adaptations of a Stephen King novel to date." Helen O'Hara of Empire Magazine gave the film three out of five stars. American critic Leonard Maltin called it "A well-made hellraiser." Time Out praised "Hooper's fluid camerawork, creepy atmospherics, and skilful handling of the gripping climax." Salem's Lot was also placed on Time Out's list of best vampire films. The Science Fiction, Horror and Fantasy Film Review called it "one of the most underrated of all King adaptations". Brian McKay of eFilm Critic wrote "Although I'll admit it is incredibly dated, it still manages to be thoroughly creepy." Salem's Lot was featured on AMC's list of Remembering Made-for-TV Terrors and Reggie Nalder's Nosferatu-like portrayal of Kurt Barlow was ranked #8 on Entertainment Weekly's "20 Greatest Vampires". Ronnie Scribner's infamous "window" scene as the child vampire Ralphie Glick was ranked #4 on Empire Magazine's list of "Top 10 Scariest Movie Scenes" and was ranked #42 on the UK Channel 4's 100 Greatest Scary Moments (2003). The 112-minute "movie" version of the miniseries has been mostly disparaged in recent years, though it was preferred by some people including Stephen King himself. A sequel television series, intended to air on NBC, was originally planned. The series was to be produced by Richard Korbitz and involved Robert Bloch, and was set to continue the vampire hunting actives of Ben Mears and Mark Petrie, though it was ultimately never made. In a 1989 Fangoria interview, actor Reggie Nalder acknowledged to have spoken with production people about a sequel to Salem's Lot, but nothing came out of it. In 1987, a loose sequel named A Return to Salem's Lot was released, directed and written by Larry Cohen. The sequel used the poster art from the original depicting Nalder as Kurt Barlow, although the film features neither the character nor the actor. In 2004, a new television adaptation of Salem's Lot was made by TNT in association with Warner Bros. Directed by Mikael Salomon, the remake was shown in two parts with a similar running length to the original 1979 miniseries. It stars Rob Lowe as Ben Mears, Donald Sutherland as Richard Straker, Rutger Hauer as Kurt Barlow, and James Cromwell as Father Callahan (a substantially expanded role compared to the 1979 version). ^ "Bryan Fuller's graphic photo of woman impaled on antlers". ^ Salem's Lot at Rotten Tomatoes. ^ "20 Greatest Vampires". Entertainment Weekly. July 31, 2009. ^ Jones, Stephen (2002). Creepshows: The Illustrated Stephen King Movie Guide. Billboard Books. ISBN 978-0-8230-7884-4.